Southern Forest Water Futures Project: WA Department of Water’s Southern Forest Water Futures project aimed to test the concept of community dams as a strategy for making an additional 12 GL/yr of reliable water available to support the expansion of irrigated agriculture. The Upper Lefroy Catchment was identified as a suitable model catchment for testing the viability of community dams and how they are funded as a future growth strategy. The Manjimup-Pemberton district is a significant horticultural area in southern Western Australia, producing 40% of the State’s potatoes, 25% of apples, and a high proportion of cauliflowers, beans, peas and onions. Water availability is constrained and close to fully allocated in 7 of the 15 catchments, limiting further expansion of irrigated agriculture. Strategically located community dams with reticulated supplies to multiple properties was identified as a means to increase water supply by allowing storage of lower reliability water in wetter years. The client required a means to investigate, assess and recommend the most viable option for a local water supply scheme incorporating community dams and associated infrastructure. Modelling Solution: To meet the client’s requirements, Verterra constructed a Goldsim model to illustrate expected grower behaviour and likely cost of water from a range of 1-2 GL community dam options. GoldSim is dynamic probabilistic software model which can be used to develop a water management framework and methodology for integrating different components of water infrastructure while accounting for natural variability in rainfall and streamflow. This probabilistic modelling approach enabled a risk analysis to be incorporated into the evaluation of potential environmental and economic impacts. The stochastic Variability in catchment water balance components. Varous options for Community Dam storage. Water use demand and gross margin returns for a range of crop options. Infrastructure costs and returns and financing expenses. The model to captured the interactions between factors influencing the volume, reliability, variability and cost of constructing and operating a community dam at various locations in the upper Lefroy Catchment. The model can be used to estimate the average cost per ML for water under conditions that optimise the reliability of water under variable conditions and maximise revenue from the system. 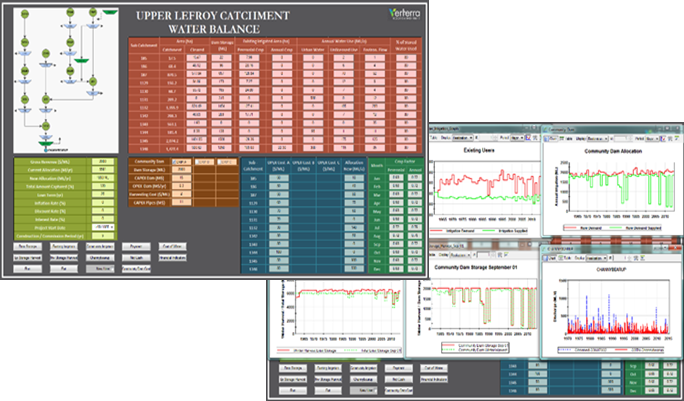 The scenario testing and optimisation model developed by Verterra allowed the client to undertake preliminary exploration of the effect of a range of different configurations and usage behaviours of the proposed community dam system, and to explore the reliability and cost of water.